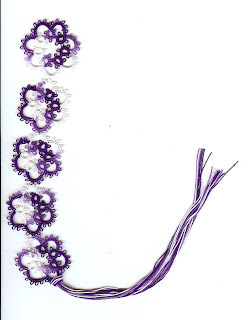 I decided to take a break from antique patterns and made this bookmark instead. I am counting is as number 12 in the 25 motif challenge. I think I had better work on the next thirteen as I am going back to work next week for a few months. I will be driving about 70 miles one way so I don't know how long I will last. At least I know the end is in site or I can stop whenever I like. The weather is about to break here. We are in for some warm days, about 40 above. I hope it melts the rest of the snow off of the decks. I can tell the snow is melting every day I look out the window. It just seems to be getting lower and lower, is that possible? This is the first winter in a long time I have had to deal with snow all winter. Most of the time is comes one day and is gone the next so this was a fun winter for me. I am glad I didn't have to get out every day and drive in it. My second grandson called yesterday to tell me he might get to go to some Technological High School. His name was one of the names selected for the first round. I understand there are only about 500 students in the school. You had to meet a certain criteria to go into the pool. The lottery will be draw the end of the month and he is excited to think he might get to go. They will be selecting 100 names. I am crossing my fingers for him. He will be a freshmen in the fall. The purple bookmark is lovely! Thank you for sharing it. Good luck to you grandson! I hope he gets into that school. Good luck to your grandson! Must be exiting getting into a new high school. Thanks for the good luck wishes for my grandson. My daughter just called and he is now one of 25. They will now narrow it down to 9 students. I really like this bookmark! I'm sure the 70 mile trip will cut into your tatting time, but think of all the tatting patterns you can think about while commuting!